Mon. 9. 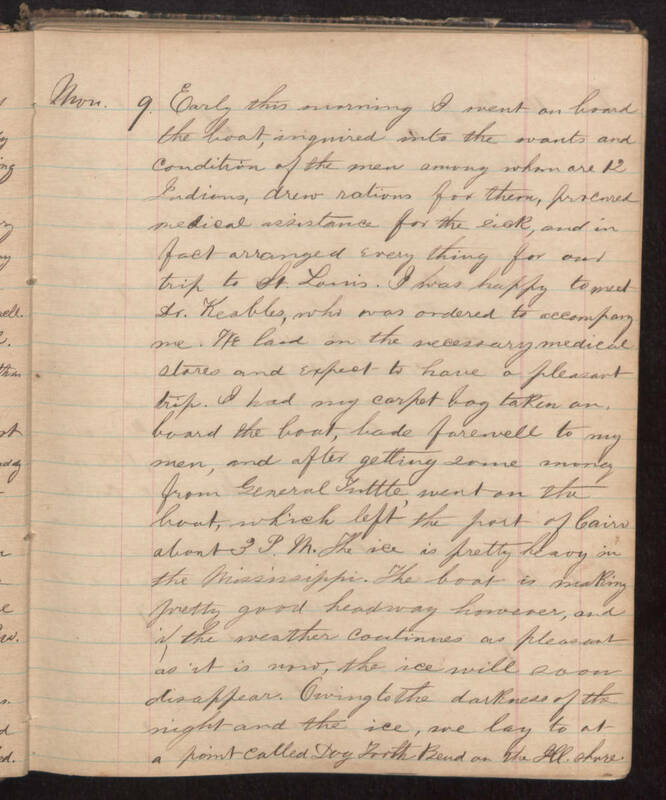 Early this morning I went on board the boat, inquired into the wants and condition of the men among whom are 12 Indians, drew rations for them, procured medical assistance for the sick, and in fact arranged every thing for our trip to St. Louis. I was happy to meet Dr. Keables, who was ordered to accompany me. We laid on the necessary medical stores and expect to have a pleasant trip. I had my carpet bag taken on board the boat, bade farewell to my men, and after getting some money from General Tuttle, went on the boat, which left the port of Cairo about 3 P. M. The ice is pretty heavy in the Mississippi. The boat is making pretty good headway however, and if the weather continues as pleasant as it is now, the ice will soon disappear. Giving to the darkness of the night and the ice, we lay to at a point called Dog Tooth Bend on the Illinois shore.